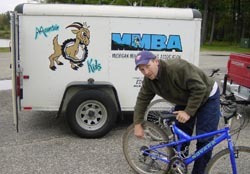 The Michigan Mountain Biking Association has been struck with unfortunate news yesterday morning. The Mountain Kids trailer was reported stolen early this morning by Mountain Kids Director, Jason Tink. The trailer was being stored in covered parking at well-lit commercial site in Farmington Hills off of Northwestern Highway. A police report was filed with the Farmington Hills police and local agents will be notified to be on the lookout, but according to the authorities the likelihood of a recovery of the trailer or its contents are slim. The trailer was home to all of the Mountain Kids Program equipment, including eight 20-inch Giant bikes and six 24-inch Novara bikes , 40 helmets, tools, and a custom bike rack made for the trailer. "This is a major loss to the MMBA," Tink said. "It has always been a very secure storage facility, and I hate that it happened while on my watch." In light of these tragic circumstances, The MMBA is working partnership within the community to replace the trailer and its contents. At the Feb 10th annual meeting will be holding a silent auction in place of a raffle to raise money for Mountain Kids and our other MMBA programs. If you should see the trailer please contact your local authorities. The MMBA will notify you with any further developments If you would like to make a donation to the MMBA or to the silent auction items please contact Marne at execdir@mmba.org. The MMBA is non-profit dedicated to trail access and to the development and maintenance of multi-use sustainable trail. We have nearly 3000 members in nine chapters across Michigan, and are one of the largest members of our national organization, International Mountain Biking Association. For more information please go to www.mmba.org.